As the National Park Service celebrates its 100th anniversary centennial it’s important to remember the key role that hunters and fishermen played in helping to create and protect the national parks since their founding. In the beginning, there was the Boone and Crocket Club, named after earlier sportsmen Daniel Boone and Davy Crockett. The club was founded in 1887 by Teddy Roosevelt and a handful of well-to-do sportsmen who realized that if they wanted to continue hunting, we had to figure out as a country a way to conserve wildlife. Roosevelt and his buddies did not believe in completely preserving, but rather conserving, which meant wise and prudent use without waste, according to Keith Balfourd, spokesman for the Boone and Crocket Club. Shortly after the club was created in 1892 John Muir founded the Sierra Club which had a strictly preservation model. In the end, the sportsmen won out. These days we know the Boone and Crocket Club mostly for the awards it gives out for largest big game animals. It’s the official record keeper for North American big game hunted with a firearm. Pope and Young covers the bowhunters. Beyond the record books, the Boone and Crocket Club has been a stalwart of conservation for 130 years. Coming up on July 14-16 is the club’s 29th Big Game Awards in Springfield, Illinois. At the time the club was created in the late 1880s, bison were virtually wiped out, and that was just the most publicized example. Mule deer, sheep, elk, antelope and almost every hunted species that was valuable had been nearly wiped out. Yellowstone National Park had was created in 1872, but it wasn’t being enforced. Logging and hunting were still taking place largely unregulated. It was thanks to pressure from the Boone and Crocket Club that brought much of it under control, Balfourd said. 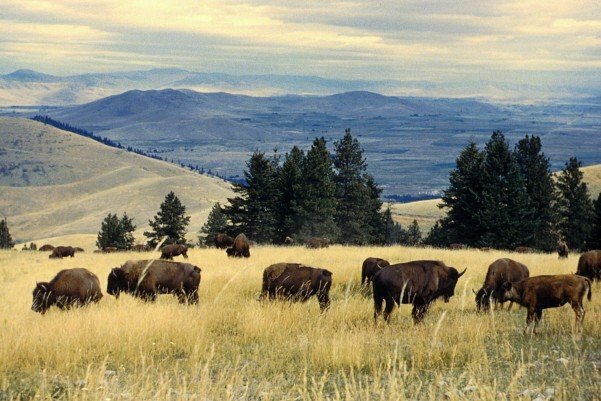 In short the bison survived, like many others back to strong numbers, so much in some cases that there arguably too many of the animals exist on certain ranges. We don’t have time to cover all of it. Our conversation touched on hot topics around canned hunts, African trophy hunting and public sentiments toward hunting. LO: We hear lots of success stories where species are improving. Where do you think the biggest challenges still lie? Balfourd: Obviously there are a lot of challenges going on environmentally. So from our perspective, what we’re seeing now is a very significant shift toward preservation. It’s a societal shift. For wildlife in particular, there’s just a growing public empathy for wildlife. We have millions of pet owners in the country. It’s a growing sentiment against hunting, the killing or the management of wildlife for any reason whatsoever. LO: Why do you think that is? Is it possibly a product of high profile cases from Africa? Balfourd: Well, this growing empathy for wildlife has been building. The “Cecil the lion” thing certainly blew the lid off the can. Right now obviously there is a very strong focus on iconic and charismatic species, the lion being one, elephant being another. What you’re seeing unfortunately is just a lack of working knowledge about ecosystem reality, conservation, the difference between conservation and preservation. Preservation is a tool in the conservation tool box. There are times, there are places where preservation is necessary. Roosevelt and the club used that tool when it was needed. They helped establish the National Parks. But preservation is an easier concept for people to grasp because no tree gets cut and no animal dies. Preservation is very focused on the life of one animal, where conservation is interested in the health and well being of the entire species. A lot of what we see today is push back on this conservation model. It’s easier than that because there are people who are supporting preservation and they think they are supporting conservation. LO: What is the club’s stance on captive hunting, these breeding farms where you can go and shoot game? Balfourd: We are a strong advocate against what we call “canned shoots.” We don’t even give it the credit of calling it a hunt. It is not hunting. It is an affront to hunting. LO: What is it exactly that you disagree with? Can’t the argument be made that you could hunt something that might be protected elsewhere? Balfourd: There are some people who would say, “hey this particular gazelle is threatened somewhere in Africa and we have a captive herd here so that’s justified.” Ok fine, but where the problem lies is, number one, we live in a democratic society, the majority vote goes. When you have an activity that is polarizing and contentious like hunting, and then you see some documentary on TV of these guys going into this controlled environment and just shooting things and calling it hunting. That’s where when you’re an organization like the club who is concerned about maintaining a functioning system of conservation that we know work through hunting and other outdoor pursuits, and you see things that erode the public’s support for hunting and potentially threatens that conservation method, you’re against those things. LO: It’s also not very sporty, is it? Balfourd: That’s another thing. Hunting is not merely shooting, it’s the preparation, the experience, the camaraderie, the connection to the natural world. Your senses are keen. You are a predator. You are observant. People drive to work every day with a cup of coffee and the radio on and get to work and don’t know how they got there. Hunters are immersed in that experience so that they hear every splash in the water or break of the branch. When you talk to most hunters the actual killing is anti-climactic. The experience is over. You’re done. Sure you’re happy you came for what you came to get, but you’re done. When hunting becomes just shooting, you can’t blame the public for not supporting that. There’s nothing more to it than just killing. Ethical fair chase hunting is applying self-restraint. There’s a reason we have the wildlife we do and that’s because hunters are engaged in this bigger picture of conservation. To donate to the club or attend it’s 29th Big Game Awards click here.